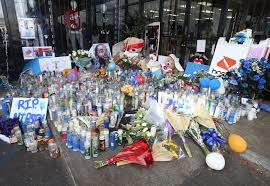 Hussle’s death has drawn attention far beyond the Crenshaw District. Celebrities and political leaders across the country have offered their condolences to Hussle’s family and friends. In an interview last week, Los Angeles Mayor Eric Garcetti praised Hussle’s contributions to South Los Angeles, a community that he acknowledged has been historically overlooked by the city’s political establishment. Hasani Leffall, 35, who knew Hussle, once worked for the rapper’s stepfather at a South Los Angeles restaurant called Bayou Grille. To emphasize the depth of feeling over Hussle’s murder within the black community of Los Angeles, he mentioned the murders of Tupac, Biggie Smalls, even Malcolm X and Martin Luther King Jr.